Keep your fitness resolutions alive this year and inspire others to remain focused on health and wellness. Boston Marathon Documentary – Now Available! The feature-length documentary about the world’s most legendary race – the Boston Marathon – arrives on Digital December 5 and On Demand December 19 from Lionsgate. 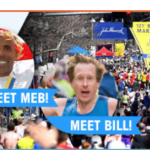 Win an All-Inclusive Trip to the Boston Marathon! John Hancock is giving away a free trip to the Boston Marathon! It’s New York City Marathon Week! This Sunday, runners own the streets of New York City! Run the Rock ‘n’ Roll Brooklyn 5 Miler or Half Marathon this Saturday! It’s not too late to sign up for either of these races!